Great class very informative” J.G. “This is one of the best classes I have ever taken, I can go back to the office and make changes right away” S.L. “I am excited about going back and implementing these strategies” A.A.
“This was so much more than a CA ‘how to’ class. It was a practice management class. I wish my doctor was here” K.K. 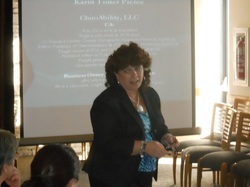 "I attended the PCA seminar where Karin Toner Pierce spoke on March 7, 2015. She seemed to have a wealth of knowledge about the ins and outs of insurance companies. Dr. Sean Englehart"
Karin Toner Pierce is a widely known sought after award winning presenter with private seminars as well as at convention and district level for state associations. Contact ChiroAbility, LLC if you'd like to schedule a seminar for your group or attend a seminar on your own; classes and workshops are given throughout the year. Contact ChiroAbility or check the website for a list of upcoming seminars/classes. Your Staff Can Generate 90% of all Referrals, ChiroPower, Inc. Effective tools to educate patients so that they will stay, pay and refer.